BETA-ALANINE – Train Harder, Longer and Stronger! Want to train harder, run longer, lift heavier and kick harder? Who doesn’t? With BETA-ALANINE you can finally achieve that workout intensity you’ve only wished you’d be able to accomplish. Backed by research, BETA-ALANINE is the one essential supplement you need to get your hands on. As an anabolic fuel BETA-ALANINE provides the stimulus to increase anaerobic and aerobic endurance and delays in muscular fatigue, allowing you to push through every workout by providing the fuel to accelerate maximal workout power. But don’t just take our word for it. In a 4 week study subjects who consumed 4 to 6.4 grams of BETA-ALANINE significantly improved their exercise performance and power output over the placebo group1. Researchers found that BETA-ALANINE also increased Carnosine’s ability to buffer lactic acid. 2. How do I take BETA-ALANINE? 5. How soon will I see results with BETA-ALANINE? 7. Are there any side effects associated with BETA-ALANINE? High dosages of BETA-ALANINE can create excessive sensory effects at the skin level in some users. 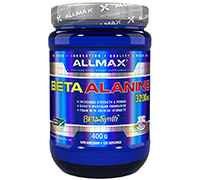 Initiate use with half of a single serving to assess your tolerance to ALLMAX Beta-SYNTH™ BETA-ALANINE. As you become accustomed to the feeling, increase your dosage to 2 servings (6.4 g). 8. Who can take BETA-ALANINE? Directions:1 teaspoon (2 times daily) dissolved in juice, water or your favorite pre-workout drink..